Not much more than when the webmail receives it in the first place. "position:fixed; left:0; right:0; top:0; bottom:0;"
I reported this bug and all I got was a lousy thank you. out of an email ? Use a white list. It's hard to code responsive emails. and max-width Which is the strongest one ? 100 % * 480 ); "
min-width : 120 px ; width : 25 % ; max-width : 100 % ; "
View Thinking Outside the <table> on Notist. HTeuMeuLeu puts presentations on for free. You can too. Full transcript of the talk. So great getting to hear from @HTeuMeuLeu #LitmusLive. Always giving, alwayd experimenting, always pushing boundaries. 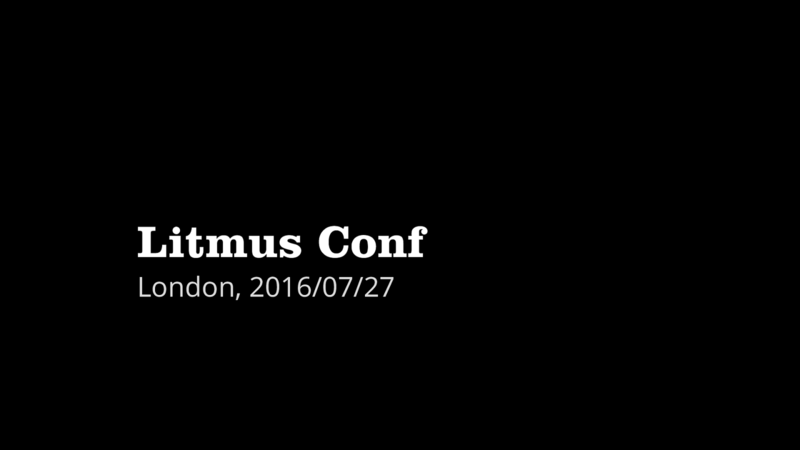 Great talk @HTeuMeuLeu at #litmuslive showing how constraints drive creativity. great work with gmail app. is on another planet. Inspiring stuff. really enjoyed your talk today. You've inspired me to learn and adopt the Fab Four technique - Thank you.